1. RTP uses both Multicast and Unicast packets. 2. Looking at the below output. What command will allow EIGRP to load balance across the two routes? 3. By default, EIGRP automatically summarises at classful boundaries and creates a summary route pointing to the Null0 interface. 4. Enhanced IGRP Hello packets are sent to the Link Local Multicast group address _______. 5. EIGRP is an open standard protocol and can be used on any vendors routers. 6. ___ is used by EIGRP to ensure that Update, Query, and Reply packets are sent reliably. 7. 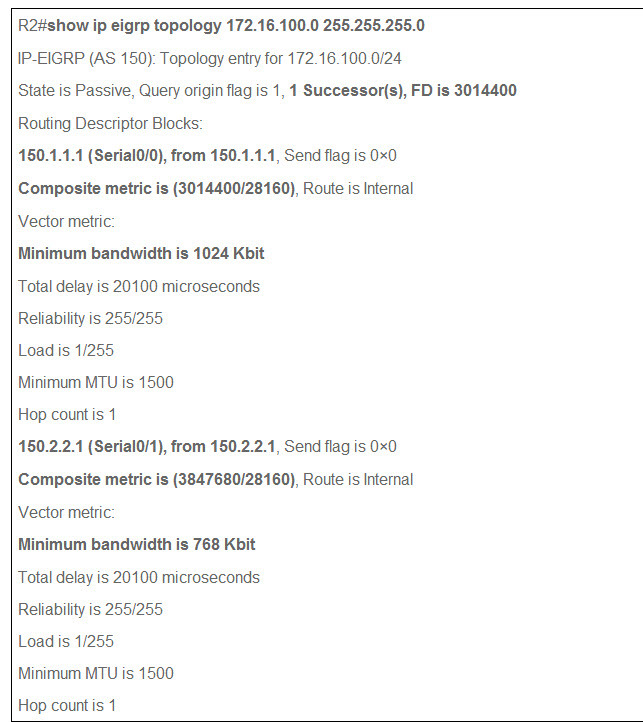 Which K values are used in EIGRP metric calculation? Choose all that apply. 8. EIGRP default values for the K values are K1 = K3 =1 and K2 = K4 = K5 = 0. If changed on one router or switch, then these values must be adjusted for all other routers or switches within the autonomous system. You configure the below networks. What will the result be? Only the networks 10.1.1.0 and 10.3.3.0 will be advertised. 10. Two routers are connected using EIGRP. One is in AS100 and the other is in AS200. They can both exchange routing updates. 11. Any other routes to the same destination network that have a lower RD than the FD of the Successor path are guaranteed to be loop-free and are referred to as Feasible Successor (FS) routes. These routes are placed into the IP routing table. 12. The primary use of the EIGRP router ID (RID) is to? 13. Looking at the fig below, the path from R1-R4-R5 will be? A successor route placed in the routing table. A feasible successor route placed in the topology table. A feasible successor route placed in the routing table. A successor route placed in the topology table. 14. You configure the below on the router using EIGRP. What will the router show in the 'show ip protocols' output. 15. Hello packets sent by EIGRP do not require an Acknowledgment to be sent confirming that they were received. 16. Convergence time for EIGRP is much slower than other distance vector protocols due to it's complicated algorithm. 17. Looking at the fig below. The route from R1-R2-R5 will be? None of the above and the route will be set to null 0. Neither a successor or feasible successor route but placed in the topology table. 18. The below message is printed on your console session. What does it mean? The router ID for the neighbor is on the wrong subnet. One of the neighbours has been put in a different subnet but a neighbor relationship can still form. 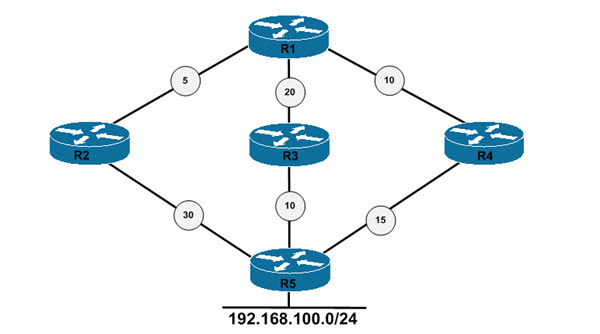 One of the neighbours has been put in a different subnet so a neighbor relationship cannot form.